Whether you need quick sandwiches, classic entrees, or casual pizza and salad, we offer a wide variety of meals to meet your needs. 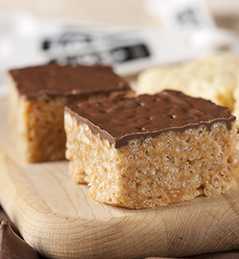 All meals include a beverage and a fresh-baked cookie for dessert. Now that’s sweet! Lunches on the go ! ½ Sandwich, 1 slice of bread (cut in half) 2oz (turkey, ham, or roasted red pepper hummus) 1 slice of cheese (cheddar, swiss, provolone or pepper jack) 2 slices of tomato, leaf lettuce. Also, in the bag is 1 package of chips, an apple, a pickle, mayonnaise packet and a mustard pack and of course a napkin * Ask about our gluten-free options. 2 slices of bread, 4oz of (Turkey, Ham or Roasted Red Pepper Hummus) 2 slices of cheese (cheddar, swiss, provolone or pepper jack) 3 slices of tomato, leaf lettuce. Also, in the bag is 1 package of chips, an apple, a pickle, a freshly baked M & M cookie, a Fireside Café Water, mayonnaise packet and a mustard pack and of course a napkin * Ask about our gluten-free options. 2 slices of bread, 4oz of (Turkey, Ham or Roasted Red Pepper Hummus) 2 slices of cheese (cheddar, swiss, provolone or pepper jack) 3 slices of tomato, leaf lettuce. Also, in the bag is 1 package of chips, house made Greek orzo pasta salad, an apple, a pickle, a freshly baked M & M cookie, a Fireside Café Water, mayonnaise packet and a mustard pack and of course a cutlery kit. * Ask about our gluten-free options. 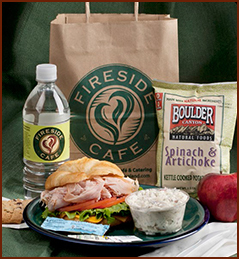 A choice of our Fireside Signature Wraps sandwiches, including Very Veggie, Turkey Bacon Avocado, BBQ Beef Brisket Cole Slaw & Cheddar Cheese, Fireside Club (see descriptions at right) Served with house made Greek orzo pasta salad or roasted red potato salad, each bag includes mayonnaise and mustard packet, an apple a bag of chips, fireside café bottled water, and a fresh-baked cookie. and of course, a cutlery kit. * Ask about our gluten-free options. Spinach wrap filled with roasted red pepper hummus, spinach, tomatoes, leaf lettuce, sprouts, kale salad, mixed shredded carrots, roasted red peppers, sliced cucumbers and black olives. Jalapeno-cheddar wrap filled with smoked turkey, bacon, avocado sliced, cheddar cheese, sliced tomato, lettuce and roasted garlic aioli. Jalapeno-cheddar wrap filled with slow cooked beef brisket, creamy Cole slaw, Gluten-free BBQ Sauce and sharp cheddar cheese. 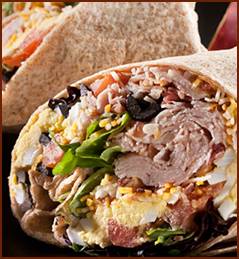 A spinach Wrap filled with roasted and grilled chicken strips, hard-boiled eggs, smoked bacon bits, cheddar and jack shredded cheese, leaf lettuce garden tomato, and ranch dressing.